Description: One of three similar prints published by Oliver Evans Woods, reflecting grave northern fears of British and French interference on behalf of the Confederacy in the Civil War. (See also “The Pending Conflict” and “The Pending Contest,” nos. 1864-2 and 1864-3.) The controversy centered on the “Alabama” and other warships built and fitted out for the Confederates in England. French Emperor Napoleon III’s military operations in Mexico in 1862 and 1863 were also perceived as dangerous to the North. The print actually appeared in the summer of 1863, when Southern diplomatic overtures to France and England threatened to result in international recognition for the Confederacy. In the center Jefferson Davis–here called “Secesh”–raises a club labeled “Pirate Alabama” over the head of a brawny Union soldier whose arms are constricted by the Constitution, and around whose waist and legs coils a poisonous snake. Davis tramples on an American flag. At right stands a leering John Bull, who holds a pile of clubs in reserve for Davis. Behind him is a prancing Napoleon III, also watching the contest. In the distance two ships burn on the ocean. Napoleon: “Whip him, Secesh, and when I get Mexico, I’ll help you whip him again.” John Bull: “Down with him, Secesh–burn his Ships–destroy his Commerce–England has plenty more such clubs for you.” Secesh: “I’ll fix him–I’ll kill him.” Soldier: “The flag of my country trampled under foot–the ships of my country burning on the ocean–while I stand here entangled in the coils of this foul Copperhead, and so bound up by Constitutional restraints, that I am unable to put forth my true strength in their behalf.” The “restraints” mentioned may refer to opposition on constitutional grounds to Lincoln’s use of what he considered valid presidential war powers. 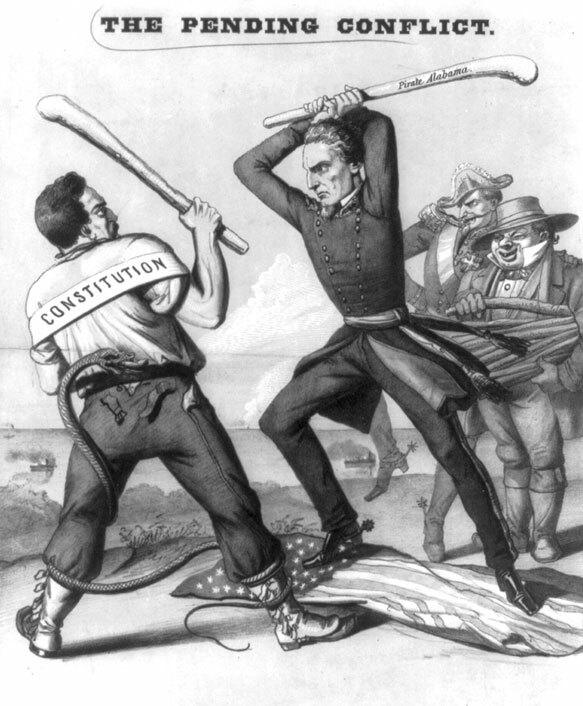 The cartoon may have been specifically occasioned by the Supreme Court’s review in the “Prize Cases” of 1863 of the legality of the Union blockade. “Copperhead” was the derogatory term used for anti-Lincoln or anti-Republican advocates of a negotiated reconciliation with the South.